I provide psychotherapy for individuals and couples. My aim is to help you identify and understand past experiences and assist you in making decisions to cultivate a life of meaning and peace. As a therapist I believe in establishing clear goals for our work together using a collaborative approach. During our meetings we can work on quieting your inner critic, understanding your fears and anxiety, and strengthening your self esteem. My goal is to create a comfortable space in which to address your concerns and help you thrive. Psychotherapy has been a second career for me. I worked in the technology field for over a decade before returning to psychology, a field that I've always felt deeply interested in. Healthy living and exercise have been a life long interest for me. 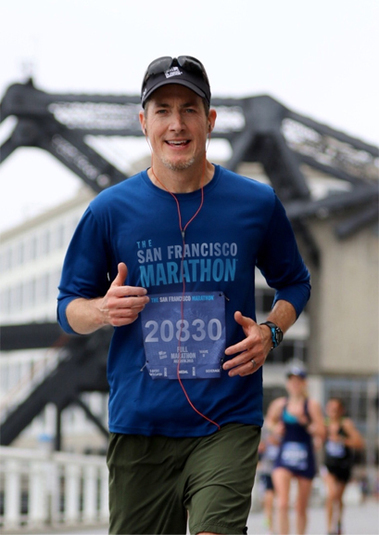 I am an avid long distance Runner and have completed many half and full distance Marathons and trail runs. I've also trained for and finished a full length Ironman Triathlon. Wow, was that incredible.